Tony Humphreys and others have asked various questions and suggested that it might be a good idea to put together a write up which provides some useful information for those who haven’t recently travelled to France. So here goes. Please use comments to add information or ask additional questions. Back then, many aspects of life in France seemed a little behind the times or quaint — not so any more. It’s a modern country with great infrastructure (with the odd idiosyncracy like stand up toilets in some places). In many ways they are ahead of us in North America. See my previous post on this. Unless you intend to explore the countryside, take the train (A previous post contains some general information on buying train tickets in France.). They are fast and not expensive. A car can be nice in the country but in cities parking and traffic is such a nuisance that you might wish you didn’t have it. I haven’t rented a car in years but, if you do,you should probably book it in advance.My understanding is that your Canadian driver’s license is fine (i.e.International License not needed). If you want to explore just one region, you might find it easier to take the train there and rent a car for a few days. This can be done at the same website you buy train tickets (www.voyages-sncf.com). If you do drive, you will find The Michelin Travel Site very useful for directions, hotels and restaurants. For those of you interested, it is also useful fro planning bike and walking routes. In fact, I used it to plan the trip Marilyn and I will take by bike from Paris to Metz for the Reunion. I’m sure most of you know that France, like virtually all of Europe, uses the Euro (current worth just under $1.55 Canadian). In general I would take little or no cash as I find you lose a lot by converting your dollars into Euros as a cash exchange. In my view, you get a much better rate if you take cash from ATMs as needed while in France and use credit cards for some larger expenses. I have gone with as little as no cash as there are ATMs right in the aeroport; but, if it makes you feel more comfortable, take 50 to 100 Euros. If you have a credit card with Chip and PIN capability you can use it to buy your train ticket to Paris (or wherever) at a machine so you won’t need cash till you get there. Cash withdrawals always come from your chequing account (i.e. you are not asked for the account); so make sure you have enough money for your trip in your chequing account. A friend of mine learned this the hard way as she couldn’t get a penny until she transferred money to her chequing account. You should be able to find these easily in a store that sells travel stuff. 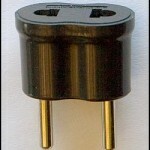 If, by any chance you are going to the UK, you need a different kind of adaptor or there are universal ones you can buy. If you are planning more than one course, you are just about always better off ordering from a fixed price menu consisting usually of a choice of Appetizers, Main Courses and Dessert. See Menus for Reunion as typical examples. Often in Brasseries and Cafes you will see the day’s special (Plat du Jour) displayed on a chalkboard and menus (Formules) of Plat du Jour plus entree or dessert. The Plat du Jour is also available alone. If you just want something light like a sandwich, look for cafes that serve them. This will be difficult for the evening meal as many of the cafes don’t serve food then. You might enjoy his blog at www.davidlebovitz.com/. I even did some personal research. At great personal sacrifce, I sat at the bar of a Paris cafe one night and watched people pay and I can assure you that there were no big tips — and, in most cases, none. If you ever read about a North American dying of starvation in a French restaurant, it will have nothing to do with the food. He just never asked for the bill. It is considered bad form to bring the bill (l’addition) until the customer asks. Just saying you’re finished isn’t enough; you have to ask specifically for the bill. The good news about the bill is that nothing is added on. If you ordered two menus at 15 Euros and a half litre of wine at 8 Euros, your bill will be 38 Euros. The tax and service were included in the price on the menu. This is unlike most of Canada where ther will be 15% or so tax and whatever tip you leave on top of the posted price. Keep that in mind when comparing prices. France has an official star system going from one to four stars. They have more to do wih amenities (number of rooms with bath, TV channels and so on). Two star hotels are very adequate and usually reasonably priced. three star hotels are often reasonably priced — especially away from Paris. Nowadays it’s pretty easy to book hotels on line although I tend to stay away from the commercial hotel booking sites. I am also somewhat skeptical of most North American guidebooks as they tend to pick particular hotels for no apparent reason. The result is that, if you go to one of the recommended hotels, the only things that seems to differentiate it is the high concentration of North Americans staying there. The Michelin Travel Site. This is a very good site and also provides restaurant information, driving directions and so on. Note that hotels and restaurants have to meet a certain standard to be included. The driving directions are particularly useful as you can select the fastest route, scenic routes and even bicycle and walking routes. I actually find this site more useful for planning bike rides than Map My Ride. The Logis de France Website. This is a loosely coupled hotel chain with coverage everywhere in France. Hotels are in general moderately priced and good quality. You can book rooms on both these sites although there may be a delay of a day or so to get a confirming email. Unlike some other sites, it appears that the French and English versions are identical so use whichever language you are comfortable in.. The other way to go at it is through the Official Tourist site of the town, department or region you will be visiting. For example a search on “Champagne” and “Tourisme” will find the official Tourist Office for the region. These sites, they may offer you the ability to book directly or provide contact information for the hotels. Breakfast is very variable these days. Some offer just the traditional bread, croissants (which is infinitely better than what we in North America call a croissant) and coffee while others have a fairly extensive buffet. Sometimes these are reasonably priced and sometimes not. If possible, I usually book without breakfast and then make up my mind when I get to the hotel. Most rooms in two star hotels have private bathroom facilities but a few may not. Make sure you’re getting what you expect when booking (It should be clearly stated). Note that many rooms have just a shower rather than a bath; so, if a bath is important to you, make sure you choose a room with one. Not all hotels have elevators; so, if you have a probelm with a few flights of stairs, make sure there is an elevator.It will be indicated on the hotel description. I am often asked for recommendations on hotels in Paris. As we now rent an apartment when we go, I have seldom stayed in a Paris hotel in the last few years. However, I will make a few suggestions. By the way, the apartment option can be viable for stays as short as three days, although I would suggest that you try to stay a week if you go this way. Paris hotels can be very expensive, especially in areas like near the Champs Elysees. However,other areas can be quite reasonable. Areas that I have stayed in and would recommend are near the Bastille, near Place de la Republique and Montparnasse. Some areas of the left bank can have reasonable prices. To find a hotel, I would recommend the websites mentioned above. To this I would add one other chain. Ibis Hotels are very standard with fairly small but functional and clean rooms and they are typically 70 to 90 Euros in central Paris. (I do note that they are higher than this in early October). The Paris Tourist Bureau site is also very good and you can book rooms right on this site. They also rate the hotels inn terms of reviews received. I wouldn’t worry about a hotel that has two stars or more and a reasonable approval rate.